Hello everyone! I’m Asia and I write over at Fun at Home with Kids. I have two little ones: a daughter, S, who is almost 4 and a son, X, who just turned 1 in April. 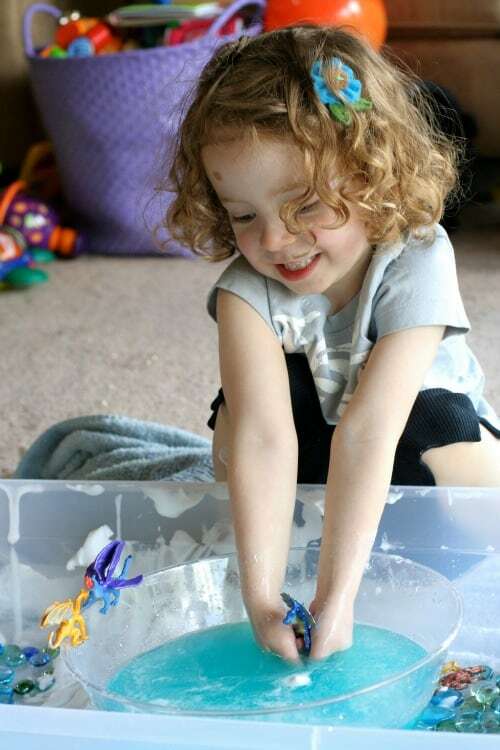 We like to dabble in a little bit of everything – art, sensory, small worlds, and science – with a focus on easy open-ended play that is also budget friendly! With a little one to care for, it’s often hard to find the time to set up elaborate small worlds for S. This was the inspiration behind my series “Simple Small Worlds”. I use mainly easy to find or repeated items and design the worlds such that they take 5 minutes or less to set up. S loves dragons, so on this day I surprised her with a new set of miniature dragons – available on Amazon (affiliate link – NurtureStore gets commission for purchases via this link) . 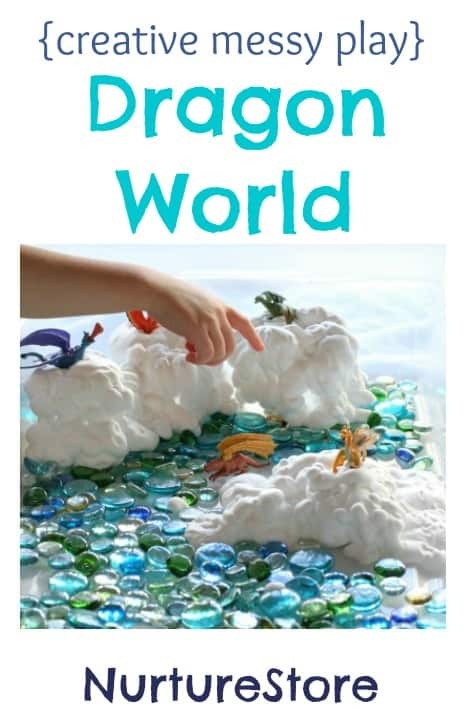 To create Dragon World, I used my favorite blue gems (they also make an appearance in our Fizzing Hidden Ocean World and Frog World) to make a sky and turned some cups upside down and covered them with shaving cream to make clouds for the dragons to sit on. She was totally right! Dragon World was missing a lake. So I grabbed a clear bowl, filled it with water, added just a touch of blue-green liquid watercolor, and voila! Dragon Lake was created. And like a good Dragon Lake, it gave off an almost other-worldly glow! S had a great time flying the dragons back into the clouds, cleaning them in the lake, and so on and so forth until the clouds were all used up and the dragons were mighty clean. 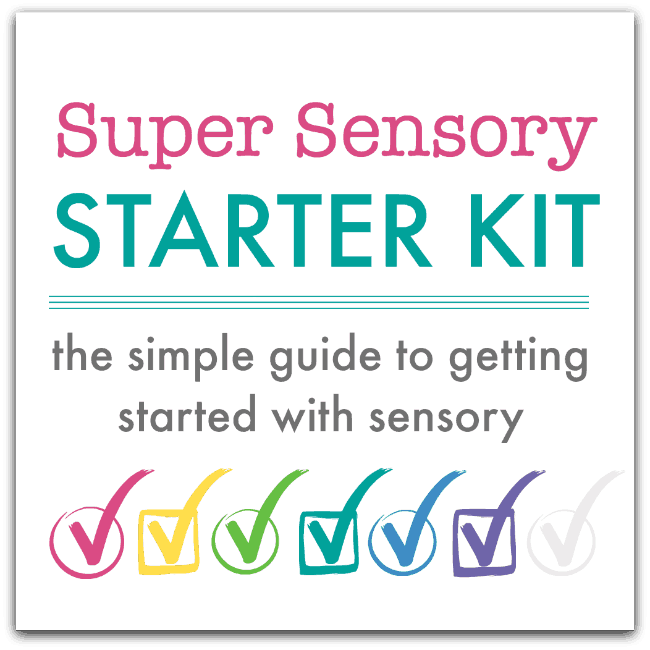 Glad you like this idea Monika – hope your kids enjoy trying it out! 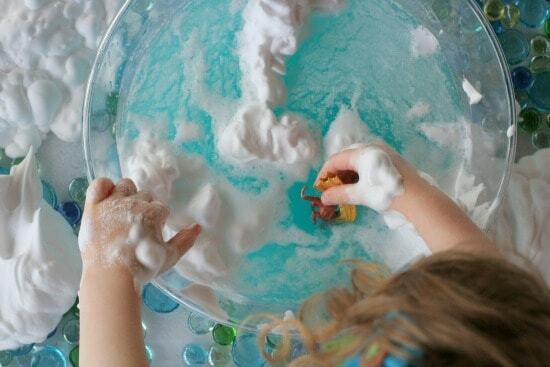 Wow, a sky sensory bin with shaving cream clouds…that’s brilliant. But with dragons on top, it’s magical! I love that she asked for a lake! The colors of this are so appealing, too. I might have to do this for the Little Engineer to play with when his godfather comes over, because his godfather loves dragons. Pinning! I love your ability to take just a few materials and create something magnificent! Even I want to play with this, so I’m sure my kid would, too! I absolutely love this!!! You’ve totally inspired me to try this with my two little ones. They would have so much fun with this! Oh my goodness what fun. 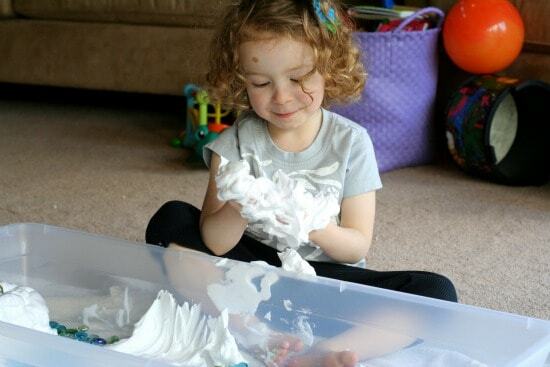 The shaving cream is such a wonderful and playful idea. Just makes you want to dive right in. And those gems are wonderful, they add a perfect, whimsical touch. I especially love that this activity doesn’t seem hard to put together. Can’t wait to try it out! Jessica – Thank you so much! It was a lot of fun – and I also loved that S had a better design in mind, LOL! Shaunna – Thank you! It is definitely a challenge to keep materials to a minimum, so I’m glad to hear that it still looks inviting! 🙂 Oh, and I definitely had fun playing in the clouds. Chelsey – Yay! I hope they love it! And thank you! Oh how my kids would LOVE to play with this! 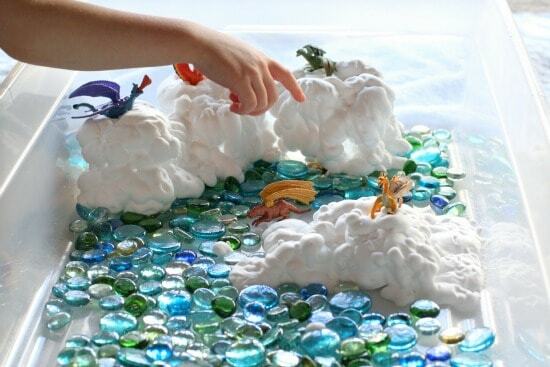 Those little dragons are gorgeous and the shaving cream clouds look SO COOL! This is such an awesome idea! I can’t wait to do this with my almost 4yr old! I’m already imagining spinoffs with miniture dinosaurs, sand, and spouting volcanoes!